This gets my vote for “Most Condescending Sign” in Lebanon. That’s a real award, right? No? Oh, well maybe they should make it a real award, even if it’s only for one year because this sign deserves it. When I saw this sign, I assumed it meant one of two things. #1 – It’s a new resraurant owned by some guy named Steve that, for some reason, serves both BBQ and Mexican food. #2 – Some guy named Steve is having a BBQ, invited a person of Mexican descent, and wants everyone in town to know it. At first glance, option #1 seems like the obvious choice. However, when I reveal that this sign is in the ultra-diverse community of Lebanon, MO (with its 94.6% White/1.2% Hispanic population), #2 doesn’t seem nearly as ludicrous. So which is it…#1 or #2? As far as I can tell, it’s option #1. 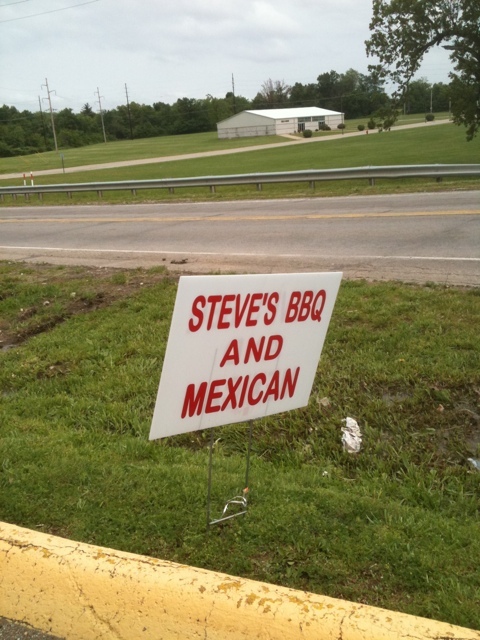 Apparently, something called “Steve” decided to open a small eatery in Lebanon that serves both BBQ and Mexican food. It definitely seems like a peculiar pairing, but more power to him for thinking outside the saucy sombrero…err, box. I went out to check on something for a customer today and this is what he gave me before I left – six freshly caught bass still on the stringer. I took the fish to the house as soon as I left his place and discovered that they were still alive! 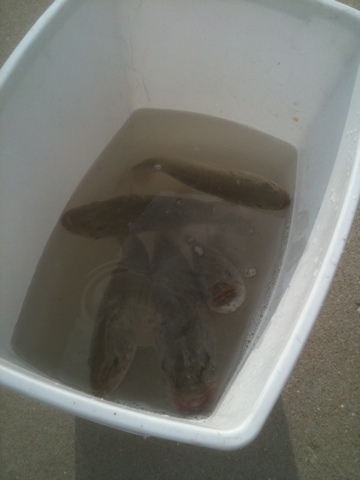 So, rather than killing and eating them, we decided to put them in a bucket of water and keep them alive. I didn’t think to take a picture of them on the stringer, but one of them in their private pool is the next best thing, I guess. It took a little longer than we thought, but we finally got all our stuff from Loveland, CO to Lebanon, MO. All except for my family that is. Daphne and Jadon will be staying out there for another week, so that they can spend some time with Daphne’s parents and have a mini-vacation before they come home. As for all of our material possessions, those are all here in Lebanon. Finally. The move started out smoothly enough. I headed out from Loveland on Thursday around 7:30 a.m. Mountain time and got to Lebanon around 1:30 a.m. Central time. Needless to say, I took my time and enjoyed the trip. Everything went smoothly, I got to stop and see my mom along the way, and really had a pretty enjoyable trip. On Friday morning, my dad, Heather, and I got up and left to head right back out to Loveland to pack up our stuff and bring it back to Lebanon. We didn’t quite make it all the way to Loveland in one day, so we ended up sleeping in Limon, CO on Friday night. It was a fairly uneventful day other than a couple of unexpected pit stops – one of which may or may not have resulted in me knocking on the door of some random person’s farmhouse somewhere in the middle of Kansas. They didn’t answer. Miraculously, we were able to make it back to a rest stop we had passed a couple miles back without me needing a change of shorts. Saturday was definitely our most productive day. We got up Saturday morning, made the two hour trip from Limon to Loveland, loaded up all our stuff in the U-Haul, and headed back. We ended up driving from Loveland to Salina, KS before stopping to sleep. This would be the part where we started having some issues. By issues, I mean there was no working A/C in the U-Haul for most of the day. It worked off and on when we left Loveland, but completely gave out somewhere in eastern Colorado. That’s fine though, it’s not like it was in the mid to high 90’s most of the day. What’s that? It was in the mid to high 90’s? Oh yeah…it was. But who’s counting? When we got up Sunday morning, we were looking forward to finishing up and being home. We had great intentions. We were going to drive the rest of the way home, unload everything into a storage unit, and be done with it. So we headed out and were making great time…or at least as well as could be expected. The A/C still didn’t work and it was hot again, but dad and Heather were troopers and had a great attitude about it. So, we are motoring along, going good…until we got near Sedalia, MO. About 15 miles before Sedalia, the U-Haul truck decided it didn’t want to run anymore. The belt on the A/C doohickey snapped. At least I think it was the doohickey…it may have be the A/C thingamajig. Whatever it was, the fact that it broke meant that we couldn’t go any farther. 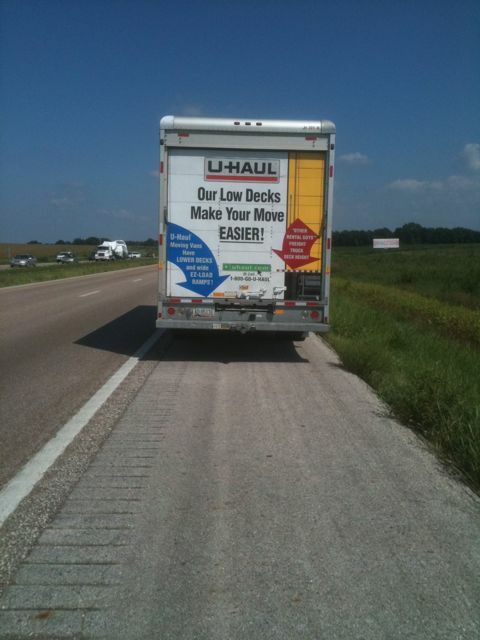 So we pulled off onto the 8 foot wide shoulder of I-70 and called the U-Haul roadside assistance people. Then we waited. Then a mechanic showed up and told us that there was nothing he could do and that the truck was going to have to be towed. So he called a tow truck for us. Then we waited. Then the big, huge, awesome tow truck came and hauled our gimpy U-Haul truck away. I kid you not – that tow truck was the size of a fire truck and moved nearly too fast for the Camry to keep up. Very impressive. After the big, awesome tow truck did it’s thing, we drove back to Lebanon and waited in eager anticipation for a call from the shop informing us that we could come retrieve it. Okay, so maybe we weren’t waiting too eagerly, considering the fact that the truck being done meant that we had to unload it, but we did wait. A couple days later, the call came and we went to pick up the truck the next day. We walked into the shop, told them we were there for the U-Haul, and were told that the keys were in it and it was ready to go. Really, that’s all it took. No showing idea or any sort of proof that the truck was ours. They must have gone through it and realized that there wasn’t much in there worth stealing and that if we were there to claim it, it must really be ours. Or we’re just back in Missouri where people tend to trust each other. It’s good to be home. So we picked up the truck, took it back to Lebanon and unload all our junk into a storage unit where it resides to this day. Now I’m halfway hoping that a tornado comes along and blows it all away so that we never have to move it all again. A person can dream, right? Once again…proof that you can get almost anything at a flea market. Haven’t been insulted lately? 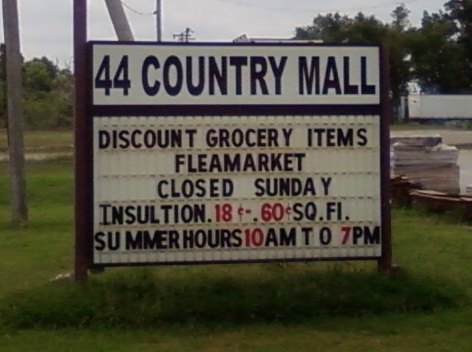 Let the fine folks at the the 44 Country Mall in Sarcoxie, MO take care of that – and for prices that anyone can afford!